Nice strong mentholated snuff! Very light and fluffy snuff when pinching out of the can. Upon opening, it has an intense menthol smell. It is very easy to take. 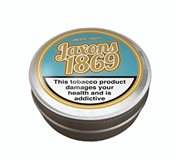 It has an intense menthol punch once inhaled and quickly clears out your sinuses. Definitely made my eyes water the first couple of times I did it! Would absolutely recommend to anyone who likes straight menthol with no other flavors added.